Our program is looking for a loving, nurturing, team-oriented Individual who desires to help teach preschool age children. Teacher will be responsible for a classroom of 12 children while Aide will help with classroom of 12. Teacher position is full time and Aide position is part time. Adherence to State Licensing guidelines and school policies to create a Christ-centered environment focusing on a fun, engaging, clean, organized, and safe classroom. Help develop and implement curriculum, lead circle time, and prepare projects. Observe children and adjust curriculum to meet their needs. Communicate and interact positively with children, parents, and co-workers. Aide - 6 semester units or more in Early Childhood Education (or equivalent). 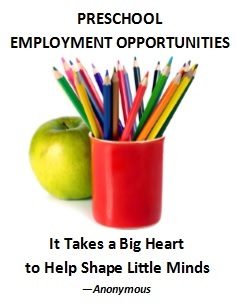 Teacher - 12 semester units or more in Early Childhood Education (or equivalent). All Applicants, will be required to sign and submit a Statement of Faith.